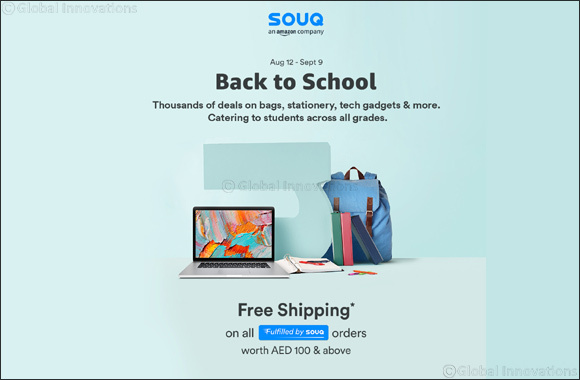 14th August 2018, Dubai, United Arab Emirates: SOUQ.com is excited to launch thousands of back-to-school deals for students across all grades starting now to September 9th. Sit back, relax and spend the last few days of summer stress-free by stocking up on all back-to-school essentials at unbeatable prices from SOUQ.com, your one stop destination for all back to school needs. Parents and students can purchase a wide selection of kids and teen backpacks, stationery, apparel, electronics including laptops, tablets and printers, as well as snacks and confectionery and much more directly from SOUQ.com without the hassle of standing in long lines and big crowds. With free shipping on all Fulfilled by SOUQ orders of AED 100 and above, SOUQ customers will have all the essentials delivered to their doorstep quickly and efficiently. Moreover, customers will also be able to purchase school essentials right from amazon USA via the Amazon Global Store selection available on SOUQ. SOUQ.com's ‘Back to School' collection features an extensive stationary selection from popular brands. Trendy sports and fashion brands will also be available for purchase on SOUQ. Parents can also benefit from the many deals on groceries and ensure their children have the right start to their day. Buy all your back to school essentials with touch of a finger directly from the SOUQ website or mobile app for Android & IOS: https://deals.souq.com/ae-en/back-to-school/cc/295. Stay on top of the daily deals and back to school surprises by registering online and subscribing to the promotional newsletters or connect with SOUQ on Facebook, Twitter, Instagram & Snapchat.